When it is up and running, there won't be any requirements to live there like sobriety or employment. MINNEAPOLIS - As temperatures drop and the number of accidental fires rise at the Minneapolis homeless encampment, the community is searching for ways to house the residents of the camp. One local affordable housing developer is using its resources to build a 70-unit apartment building in response to the encampment along Franklin and Hiawatha avenues, according to our sister station MPR. The developer is the Beacon Interfaith Housing Collaborative. It announced a campaign this week to raise private donations of up to $1 million. The project is expected to cost $18 million to $20 million total. The executive director of the collaborative, Lee Blons, says the idea came straight from the community. "The visibility [of] the encampment — people literally living in tents in our affluent community — has really shocked people," Blons said. "So we brought our clergy and congregational leaders together to ask the question, 'how can we best respond with the resources we have?'" The location of the new apartment building is still being decided. When it is up and running, there won't be any requirements to live there like sobriety or employment, Blons says. The collaborative is working to move up to 35 people who live in the encampment into existing Beacon properties. Red Lake Nation and Minneapolis-based non-profit Avivo are helping the collaborative and hope to house at least 100 people in the near future. That number only puts a small dent in the actual number of people without homes in Minnesota. 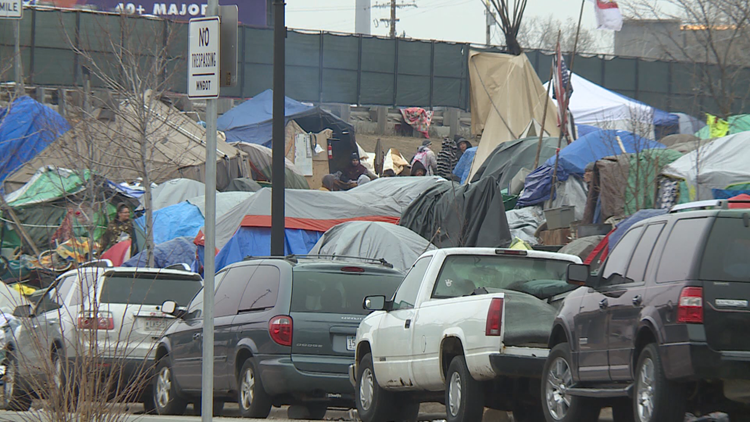 "In addition to those at the encampment, there are over a thousand people who are already on the waiting list at Hennepin County for the kind of housing that we would create," Blons said. "So as we are very excited to announce the development of a 70-unit apartment building, we also know it's not enough." Blons says about a dozen people have been housed so far, but Beacon has barely any vacant units in their 17 apartment buildings. The collaborative hopes to begin construction in 2019.